I was just a boy in school the first time I read the Rev. Martin Luther King Jr.’s Letter From Birmingham Jail, trying to imagine what it must have been like to live through those events and be part of a movement that fundamentally redefined who we are as a nation and a people. I remember learning about the Montgomery bus boycott, the Little Rock Nine, the March on Washington and Selma, Ala.’s Bloody Sunday, and I would imagine streets crowded with men and women, black and white, of all faiths, shoulder to shoulder, arms and hearts interlocked, immovable and undaunted. I would hear them singing, raising their voices to God himself to tear down the walls of Jericho. I could see them willing to sacrifice themselves for a generation they didn’t know and a day they might never see because they knew that history is not witnessed—it is made. I was just a boy in school. But when I listened closely, I could still hear them singing. And I would wish that I had been there. Today we have our chance. Our time has come. The weight of the moment is upon us, the irresistible gravity of change pulling us forward, voices echoing across generations past calling on us to live their promise and wait no more. I hear them calling, and I know that you can, too. How shall we answer? You see, the truth is, the power is ours. It always has been. History is not witnessed. It is made. It is made when thousands of men and women just like you call your state legislators and tell them that we don’t want committee meetings, panel reports, long deliberations or negotiations. When they reconvene on Monday, July 6, we want a vote to remove the Confederate battle flag once and for all from the grounds of the statehouse. History is made when we tell the legislators that 53 years is long enough to live under any symbol of division and that we refuse to wait any longer. You see, although the Confederate flag is just a symbol, it’s also a start. Like a seat at the front of a bus or at a lunch counter or an integrated water fountain, it is a start for something special, something important, something historic. And if we take that first step, maybe, then, we can talk about expanding Medicaid without resorting to demeaning and inflammatory rhetoric. Maybe, then, we can work together to ensure that every South Carolinian makes a living wage, because no one who works hard for 40 hours a week should have to live in poverty. Maybe we can do better than crumbling schools and crumbling roads and create a funding structure that makes good sense, not just good politics. Maybe we can have an honest debate about meaningful criminal-justice reform that protects communities and builds trust, and about equitable tax reform that funds 21st-century schools and infrastructure while helping hardworking South Carolinians support their families, save money and build a better future. Maybe we can finally admit that there’s something wrong when you go to jail for beating your dog but pay a fine for beating your wife, and you need a photo ID to vote but not to buy a gun. Even better, maybe we can do something about it. Years from now, generations not yet born will look back from whatever our future is to become and see this as the moment where it started, and we in it, for good or ill, will be remembered. So let us stand and be counted to make our children proud, so that when they ask, “Where were you when the moment came?” we can answer that we were here and that together we changed the world. Please, take some time to email and call your state senators and House members. Stop them in the grocery store and at church. Tell them that it’s important to you and your family that South Carolina move forward and move forward now. 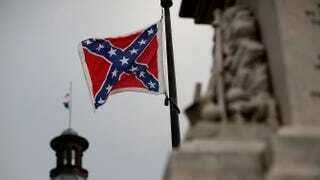 Ask them to vote on July 6, 2015, to take the Confederate flag down. History is not witnessed. It’s made. Let’s do it together. Steve Benjamin is the mayor of Columbia, S.C.